Is India on a Totalitarian Path? Arundhati Roy on Corporatism, Nationalism and World’s Largest Vote | Democracy Now! an award-winning Indian writer and renowned global justice activist. She has written many books, including The God of Small Things, which won the Booker Prize. Her new book is Capitalism: A Ghost Story. Read an excerpt from "Capitalism: A Ghost Story"
See more Arundhati Roy interviews on Democracy Now! AMY GOODMAN: Voting has begun in India in the largest election the world has ever seen. About 815 million Indians are eligible to vote over the next five weeks. The number of voters in India is more than two-and-a-half times the entire population of the United States. The election will take place in nine phases at over 900,000 polling stations across India. Results will be known on May 16th. Pre-election polls indicate Narendra Modi will likely become India’s next prime minister. Modi is the leader of the BJP, a Hindu nationalist party. He serves—he served as the chief minister of Gujarat, where one of India’s worst anti-Muslim riots occurred in 2002 that left at least a thousand people dead. After the bloodshed, the U.S. State Department revoked Modi’s visa, saying it could not grant a visa to any foreign government official who, quote, “was responsible for or directly carried out, at any time, particularly severe violations of religious freedom.” Modi has never apologized for or explained his actions at the time of the riots. Modi’s main challenger to become prime minister is Rahul Gandhi of the ruling Congress party. Gandhi is heir to the Nehru-Gandhi dynasty that’s governed India for much of its post-independence history. Several smaller regional parties and the new anti-corruption Common Man Party are also in the running. If no single party wins a clear majority, the smaller parties could play a crucial role in forming a coalition government. Well, today we spend the hour with one of India’s most famous authors and one of its fiercest critics, Arundhati Roy. In 1997, Roy won the Booker Prize for her novel, The God of Small Things. Since then, she has focused on nonfiction. Her books include An Ordinary Person’s Guide to Empire, Field Notes on Democracy: Listening to Grasshoppers and Walking with the Comrades. Her latest book is titled Capitalism: A Ghost Story. Nermeen Shaikh and I recently sat down with Arundhati Roy when she was in New York. We began by asking about her new book and the changes that have taken place in India since it opened its economy in the early ’90s. ARUNDHATI ROY: So, “In India, the 300 million of us who belong to the new, post-IMF 'reforms' middle class—the market—live side by side with the spirits of the nether world, the poltergeists of dead rivers, dry wells, bald mountains and denuded forests; the ghosts of 250,000 debt-ridden farmers who have killed themselves, and the 800 million who have been impoverished and dispossessed to make way for us. And who survive on less than half a dollar, which is 20 Indian rupees, a day. AMY GOODMAN: Arundhati Roy, reading from her new book, Capitalism: A Ghost Story. We’ll be back with her in a minute. AMY GOODMAN: This is Democracy Now!, democracynow.org, The War and Peace Report. I’m Amy Goodman, as we continue our conversation with the world-renowned author Arundhati Roy. Voting has just begun in India in the largest election the world has ever seen. About 815 million Indians are eligible to vote over the next five weeks. The number of eligible voters in India is larger than the total population of the United States and European Union combined. Arundhati Roy won the Booker Prize in 1997 for her novel, The God of Small Things. Her latest book is called Capitalism: A Love Story [sic]. Democracy Now! 's — Capitalism: A Ghost Story. Democracy Now! 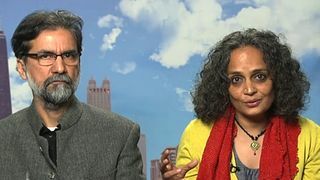 's Nermeen Shaikh and I talked to Arundhati Roy about the changes in India she describes in her latest book and the implications for the elections. ARUNDHATI ROY: You know, whenever I speak in India, I say that in the late '80s what the government did was they opened two locks. One was the lock of the free—of the market. The Indian market was not a free market, not an open market; it was a regulated market. They opened the lock of the markets. And they opened the lock of the Babri Masjid, which for years had been a disputed site, you know, and they opened it. And both those locks—the opening of both those locks eventually led to two kinds of totalitarianisms. One—and they both led to two kinds of manufactured terrorisms. You know, so the lock of the open market led to what are now being described as the Maoist terrorist, which includes all of us, you know, all of us. Anybody who's speaking against this kind of economic totalitarianism is a Maoist, whether you are a Maoist or not. And the other, you know, the Islamist terrorist. So, what happens is that both the Congress party and the BJP has different prioritizations for which terrorist is on the top of the list, you know? But what happens is that whoever wins the elections, they always have an excuse to continue to militarize. AMY GOODMAN: Indian writer Arundhati Roy, author of the new book, Capitalism: A Ghost Story. India is in the midst of the largest election in world history. We’ll be back with Arundhati Roy in a minute. AMY GOODMAN: This is Democracy Now!, democracynow.org, The War and Peace Report. I’m Amy Goodman. Together with Nermeen Shaikh, we sat down with the world-renowned author Arundhati Roy when she came to the United States last week. Arundhati Roy won the Booker Prize in 1997 for her novel The God of Small Things. She begins with a reading from her new book, Capitalism: A Ghost Story. “The Rockefeller Foundation, in keeping with J.D. Rockefeller’s ideals, had worked closely with Martin Luther King Sr. (father of Martin Luther King Jr). But his influence waned with the rise of the more militant organizations—the Student Nonviolent Coordinating Committee (SNCC) and the Black Panthers. The Ford and Rockefeller Foundations moved in. In 1970, they donated $15 million to 'moderate' black organizations, giving people grants, fellowships, scholarships, job training programs for dropouts and seed money for black-owned businesses. Repression, infighting and the honey trap of funding led to the gradual atrophying of the radical black organizations. “She fell silent for a while. I was uneasy and not at all sure that I wanted to hear the rest of what she had to say. She, however, was sure that she was going to say it. 'In this last year,' she said, 'less than a year actually—you've had too much of everything—fame, money, prizes, adulation, criticism, condemnation, ridicule, love, hate, anger, envy, generosity—everything. In some ways it’s a perfect story. Perfectly baroque in its excess. The trouble is that it has, or can have, only one perfect ending.’ Her eyes were on me, bright with a slanting, probing brilliance. She knew that I knew what she was going to say. She was insane. “I told my friend there was no such thing as a perfect story. I said in any case hers was an external view of things, this assumption that the trajectory of a person’s happiness, or let’s say fulfillment, had peaked (and now must trough) because she had accidentally stumbled upon 'success.' It was premised on the unimaginative belief that wealth and fame were the mandatory stuff of everybody’s dreams. “You’ve lived too long in New York, I told her. There are other worlds. Other kinds of dreams. Dreams in which failure is feasible. Honorable. And sometimes even worth striving for. Worlds in which recognition is not the only barometer of brilliance or human worth. There are plenty of warriors that I know and love, people far more valuable than myself, who go to war each day, knowing in advance that they will fail. True, they are less 'successful' in the most vulgar sense of the word, but by no means less fulfilled. AMY GOODMAN: Arundhati Roy, reading from her essay, “The End of Imagination.” She is the author of the new book, Capitalism: A Ghost Story. To read an excerpt of that new book, you can go to democracynow.org. We will also link there to our full archive of interviews with Arundhati Roy, as well as her speeches. That’s democracynow.org. To watch this broadcast, to listen to it, to read the transcript of what Arundhati Roy said, you can go to democracynow.org, as well.